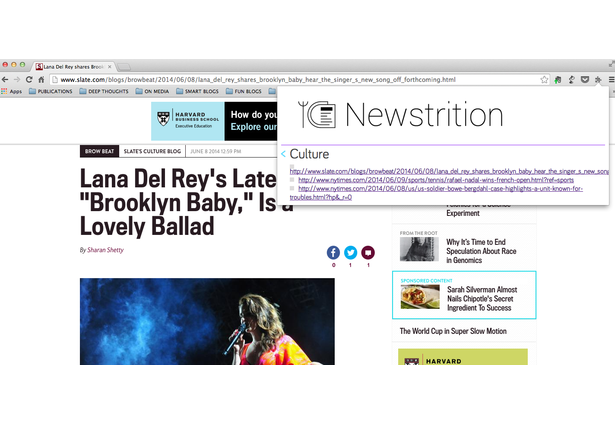 Newstrition is a Google Chrome extension that uses your browser history to generate visualizations of what news you consume (by topic and by source). We're inspired by the proliferation of personal accountability apps in the world of food and financial health (like FitBit, Weight Watchers, RunKeeper and Mint). We like the news-as-food metaphor and think readers can benefit from being made aware of what they are consuming and from where. What we've built is an extension that does just that. 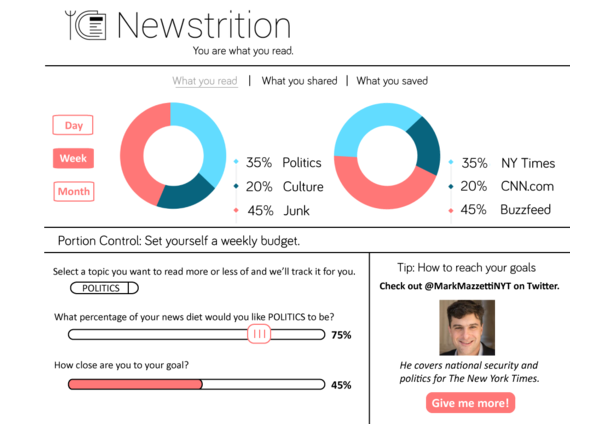 For the sake of presentation and conversation, we've also mocked-up a dashboard. In addition to visualizations of consumption habits, a user can set goals for how much of what type of content they want to consume, track their progress and receive suggestions from the Newstrition Staff on where to find more of the content they want. Comments for this submission are closed. View the software in jihiitea's portfolio to continue the conversation.